An LED product package states “energy-saving 60-watt equivalent,” implying a direct one-for-one replacement for the common 60 W incandescent light bulb. Will it really produce the same quantity and quality of light? The checklist below summarizes key performance characteristics that should be considered when comparing LED products and evaluating their equivalency to conventional lighting technologies. No two products are identical in every respect, and tradeoffs are often necessary due to inherent differences in technologies. In fact, it may be possible to improve performance in one category, such as color rendition, while achieving equivalency in others. For any given application, a number of additional characteristics should be considered during product selection. Notable examples include sensitivity to heat in enclosed spaces, dimming capability and behavior, flicker, and power factor. Will the product appear equally bright? Equivalent products should produce the same light output, as measured in lumens. Wattage (input power) cannot be used to compare light output, even between two LED products. Will the product direct or focus light in the same manner? Equivalent products should emit similar amounts of light in any given direction. That is, they should have a comparable luminous intensity distribution. It may also be important to consider the pattern created by the light, such as the sharpness of beam edges. What color light does the product emit? How do objects look under the light? and Appearance An equivalent LED product should emit light that appears the same color (e.g., warm-white or cool-white) as the conventional light source, and any given object should appear the same color when illuminated by the light sources being compared. These attributes are typically characterized using the correlated color temperature (CCT) and color rendering index (CRI) metrics, respectively. Is the product the same shape and size? A replacement lamp is of little use if it does not fit into an existing luminaire. Equivalent products should be within dimensional tolerances established by the American National Standards Institute (ANSI) for a variety of lamp types. Will the new product work with my existing system? Different lighting technologies often require different accessory components. It is important to know if the product will perform as desired given the type of transformer, type of dimmer, and the connected load. Manufacturers should provide compatibility charts for their products. How long will the product last? Comparisons of rated useful lifetime are difficult because of the different rating methods used for LEDs and other light sources. Longer lifetime claims should be accompanied by longer war­ranty periods, and the product should continue to perform for the duration of the rated life. Is the product worth the extra money? It is important to consider lifetime costs, not just the initial cost, because energy and mainte­nance savings can yield an attractive return on investment. LED products are typically more expensive on a first-cost basis, but prices continue to fall as performance improves. In a highly competitive and rapidly changing lighting marketplace, establishing equivalency is the first step toward making an informed buying decision. Although no attribute is universally more important, quantity and distribution of light are perhaps the two basic attributes most directly related to equivalency claims. A prevalent claim in marketing literature is that an energy saving LED product is equivalent to a higher wattage incandescent lamp. Such claims are often ambiguous, these claims, could be taken to imply equivalent light output. CALiPER1 testing has demonstrated that such claims are often overstated, with products marketed as replacements for particular lamps (e.g., 50 W MR16) often providing light output comparable to much lower wattage versions (e.g., 20 W MR16). Figure 1 provides rough benchmarks for the lumen output of incandescent lamps with different wattages. Because LED efficacy is continually improving and varies between products, it is necessary to compare lumens rather than watts. 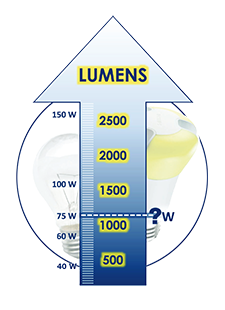 Typical lumen values for a variety of product types can be found in the DOE Lighting Facts performance scales for residential and commercial products2. Equivalent products should have similar light distributions to ensure the lumens produced are directed where they are needed. An IES LM-79 photometric report, which should include lumen output and a polar plot of the luminous intensity distribution,3 can be an important aid in the comparison process. For example, Figure 2 shows the intensity distributions for a 60 W incandescent lamp (black line) and two different LED replacement lamps (red and blue lines). The total lumen output of both LED lamps is comparable to the 60 W incandescent, but only one of them (blue) produces a similar omnidirectional distribution. Although a directional “beam” maybe of benefit in some applications, it is important to be aware of these differences. 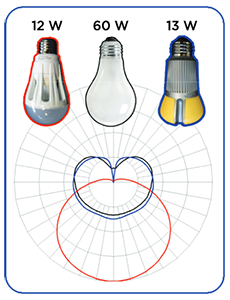 When replacing incandescent PAR lamps and other directional light sources, intensity distribution metrics such as the beam angle—which determines the basic “spot” and “flood” classifications—should be used in combination with lumen output and center beam candlepower (CBCP) to ensure proper focusing of the light. In addition to lumen output and spatial distribution of light, consideration should be given to the other aspects described in this fact sheet before evaluating energy savings. Detailed information and objective guidance can be found in other DOE Solid-State Lighting (SSL) fact sheets, 4 on the Lighting Facts website,5 and in CALiPER reports. 3 Polar plots provide a graphical representation of the intensity distribution of a lamp. Figure 2 traces luminous intensity in a vertical plane passing through the light source. Note that whereas the black-traced and blue-traced products direct some light upward, the red-traced product directs nearly all light downward.